People often confuse metaphor and simile with analogy. It’s understand-able because they are similar concepts involving comparison. The difference is that unlike metaphor and simile, an analogy isn’t a figure of speech. It’s a rational, often complex comparing of two concepts. An analogy might even include metaphors or similes in showing the relationship between the two things being compared. 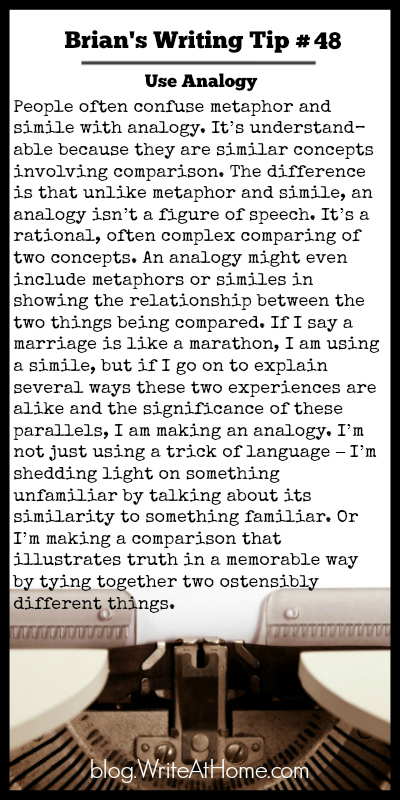 If I say a marriage is like a marathon, I am using a simile, but if I go on to explain several ways these two experiences are alike and the significance of these parallels, I am making an analogy. I’m not just using a trick of language – I’m shedding light on something unfamiliar by talking about its similarity to something familiar. Or I’m making a comparison that illustrates truth in a memorable way by tying together two ostensibly different things. Please feel free to leave your comments in the Reply area below.